Primarily used to treat lung diseases and coughs, the mullein plant has been popular throughout history for a number of industrial uses, too. Mullein, a biennial herb native primarily to Europe, Africa, and Asia, has been traditionally prescribed as a remedy for a number of health conditions, mainly respiratory illnesses. Although it has been used medicinally since ancient times, the popularity of mullein has been increasing commercially for the past few years, as scientific research has corroborated the effectiveness of some of its folk uses. Treating respiratory infections. Mullein is useful for treating cough, sore throat, bronchitis and tuberculosis, as well as asthma and croup. It can also clear the airways of congestion due to sinusitis, hay fever, and chronic catarrh. Soothing inflammatory pain. Mullein's antinociceptive and anti-inflammatory properties have been traditionally used for treating earaches and headaches, as well as neuralgic pain, arthritis, and rheumatism. Supporting the nervous system. Because of its ability to stimulate or strengthen neural function, mullein is also used for treating stress and anxiety, as well as nervous palpitations, cramps, and colics. Additionally, mullein's astringent and anti-inflammatory properties have been traditionally used for the topical treatment of hemorrhoids, minor wounds, and scraps, as well as for improving kidney health and urinary tract problems, such as cystitis and fluid retention. Mullein contains a number of useful compounds, mainly saponins, tannins, and mucilage, which are thought to be largely responsible for the medicinal actions of the herb. Mullein contains around 3% mucilage, which is part of the reason the plant is often used for respiratory illness. The expectorant qualities of the plant are also thought to be due to its saponins. Mullein extracts have shown antibacterial activity, effectively inhibiting strains like Klebsiella pneumonia, Staphylococcus aureus, Staphylococcus epidermidis, and Escherichia coli. 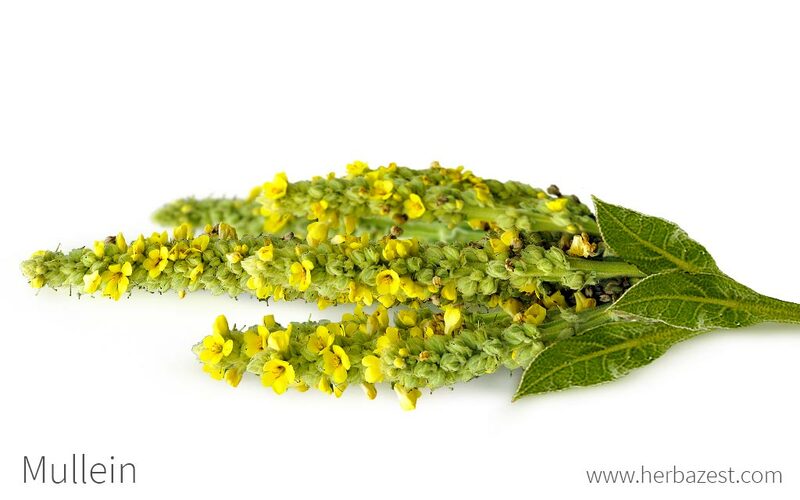 Flavonoids are directly associated with antioxidant activity, thus mullein is an excellent antioxidant. The iridoid glycosides are the constituents responsible for the anti-inflammatory activity of mullein, and the tannins lend the plant an astringent effect. In addition, the volatile oils give the plant its wound-healing qualities. The use of common mullein extracts in folk medicine begun recently to be supported by an increasing number of research studies. Herbs well-known for their decongestant and antibacterial activities are coltsfoot, eucalyptus, and hibiscus. On the other hand, inflammatory properties can be found in ginger and turmeric. Mulleins is considered generally safe for topical and oral use; however, sensitive people may experience skin inflammation or drowsiness after consumption. Due to lack of studies, the consumption of mullein is not recommended for pregnant and breastfeeding women. Mullein should not be given to children. Likewise, mullein must be used with caution in people taking anticoagulants, and those with a known allergy or hypersensitivity to mullein should avoid its consumption. Infusion. For those with respiratory infections or who are just generally congested, a mullein tea should help ease the symptoms, as the tannins help reduce inflammation of the respiratory tract. Poultice. The crushed leaves of mullein have been traditionally used for the topical treatment of headaches and migraines, as well as for healing burns and superficial wounds. When applied externally, mullein leaves are thought to soften and protect the skin, and have been used to remove warts. Powder. The dried leaves of mullein are ground into a light green-brown powder that helps relieve congestion and cough. Mullein leaf powder can be added to foods, as well as to beverages, smoothies, and green drinks. Liquid extract. This concentrated preparation needs to be diluted in water, and can be taken to support the respiratory system. Essential oil. Extracted from the cold pressed seeds, mullein essential oil is a a great source of omega-3 fatty acids, and it is used for skin care and for treating respiratory conditions. Ointment. This preparation, which involves the maceration of mullein flowers in a carrier oil, can be used for treating ear infections, as well as dry skin and other dermatological complains. Cream. Easily absorbed, the cream of mullet carries all the beneficial nutrients of the herb, and can be applied over the skin for a demulcent, soothing effect. Capsules. In supplemental form, mullein can be taken three times a day, in standardized doses, for treating respiratory infections. Mullein is not generally eaten raw, but rather is dried and crushed. In this form, as well as in powder, the herb can be found in specialized herbal stores and is widely available through online retailers. Mullet also can be purchased in remedial forms, such as extracts, essential oil, and creams, which are most commonly found in specialized herbal stores and online retailers. The same applies to mullein supplements, like capsules, which are available in a variety of brands and concentrations both online and in herbal shops, and are promoted mainly for respiratory support. Mullein not only possess a number of useful healing properties, but it is also an easy-to-grow, pretty garden biennial, which requires just a little care and attention in order to flourish. Mullein grows best in temperate and dry regions, with plenty of sunlight, as these conditions will help prevent mildew or other fungi from infesting. It prefers slightly alkaline and sandy soils that are well-drained. Mullein plants would not live long in moist garden soil, so they must be watered sparingly. Mullein is grown directly from the seed into its final ground, although it can be transplanted as well. It requires plenty of space in order for the seeds to germinate. 3 - 4 feet (1 m) between rows, and two feet (60 cm) between each plant, would be enough for mullein to grow comfortably. While mullein flowers don't bloom all at the same time, some inflorescence can usually be seen from late June to August. Great mullein is a biennial plant that can grow up to six feet (1.8 m) tall, although on average it reaches around four feet (1.2 m) tall. It grows best in dry, open spaces, and for this reason, can often be seen at the sides of roads or on wastelands. Mullein is an erect plant that grows as a rosette of downy, grey leaves in its first year. In the second year, a cluster of fragrant yellow flowers sprout from the top, giving the plant its height. It belongs to the Schrophulariaceae plant family, although it is more commonly known as the figwort family, and is classified under the Verbascum genus. This genus includes over 300 species, the most common of which are V. phlomoides, V. thapsiforme, and V. densiflorum. As great mullein grows in a significantly large area, three different subspecies have been identified so far. Verbascum thapsus ssp. thapsus is widespread through Eurasia, while the crassifolium subspecies, with larger flowers and less densely haired stamens, grows only in the central Mediterranean and southwestern Austria. The giganteum subspecies is a Spanish native has white flowers and decurrent leaves. There is also a great variety of hybrids among these three subspecies, most of them created through human intervention. It is believed that Europeans discovered the medicinal potential of common mullein in the island of Thapsos, in Greece, hence its botanical name, Verbascum thapsus. Ancient physicians, such as Galen, Hippocrates, Plinius, and Dioscorides wrote about the herbs's various medicinal uses. The plant was introduced to North America by European settlers and was commonly used as a remedy for cough and diarrhea. Later, mullein was known as "Quakers' rouge" because Quaker girls were said to rub it on their cheeks to make them red. In the 19th century, people smoked mullein's roots or dried flowers to treat respiratory diseases and asthma symptoms. In Greek mythology, Ulisses carried mullein to protect himself from the charms of the sorceress Circe. When the plan was introduced to North America by early European settlers, Native Americans adopted many of its traditional uses and gave it spiritual value in many of their sacred rituals. Historically, the economic importance of this plant rested on its use as a torch, fish bait, and as a healing agent. Because it grows wild in many places, mullein cultivation has not produced a significant economic impact. Dye. Mullein remains one of the preferred plants for manufacturing natural hair dyes. Personal hygiene. The leaf is used by campers as a natural alternative to toilet paper, and can also be used as diapers, food wrappers, and even comfortable insoles for shoes. Caution must be taken, however, when using the dry leaves - they can be irritating to the skin owing to the tiny hairs that cover them. Fishing. Mullein was also traditionally used to stun fish and catch them in large quantities, and this practice is still in use today in some parts of the world.